A large rectangular 38" x 48" American Classical style carved giltwood frame for mirror or painting, with boldly carved fluting, and raised square and roundel centre. May be hung horizontally or vertically. Enhances either a traditional or contemporary setting. 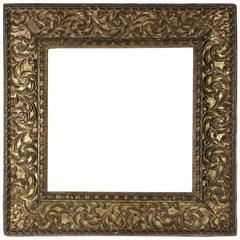 Wooden frame mirror with gold toned corner accents and tan toned frame. 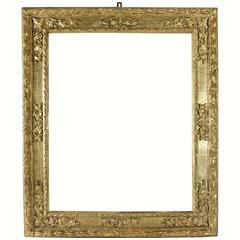 Beautiful Italian carved giltwood frame mounted as mirror, Northern Italy, 17th century. Sight size as frame is: 88 cm x 71cm Overall size is: 114 cm x 97 cm. Fabulous Italian frame mounted as mirror, Northern Italy, late 16th century, early 17th century, carved giltwood, resized Sight size as frame is 67 cm x 68 cm. 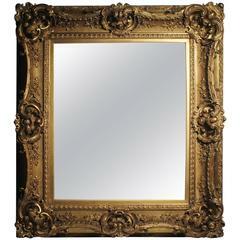 Monumental sheet gilded mirror frame / picture frame, circa 1850. Multi-level profiled frame in solid wood and genuine gold leaf. (M-40).